I believe pediatric care is most effective when children, their parents, and pediatrician work together toward a common goal of good health. I encourage questions from parents and children and appreciate the opportunity to educate families about illnesses and treatment options. Together, we work through the challenges and joys of parenting. Whenever possible, my focus is on preventive health care, integrating my training in traditional evidence-based medicine with a more holistic approach to wellness." Dr. Mooney was born and raised in St. Louis, Missouri. After completing her B.S. at the University of Notre Dame, she attended Washington University School of Medicine in St. Louis. She moved to the Pacific Northwest for her internship and residency at the University of Washington program at Seattle Children’s Hospital. 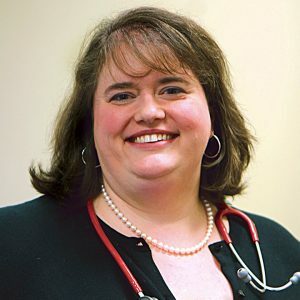 After practicing general pediatrics for several years in the Seattle area, she began practicing in Portland in 2006. Throughout her career, she has been actively involved in medical quality improvement efforts, exploring ways in which pediatricians can improve the care they provide to families. Dr. Mooney is married and loves being a mom to her two boys, Peter and William, who have managed to provide plenty of hands-on experience to complement her medical training. She also enjoys swimming, reading, music, and travel. "I love this pediatrician office. My kids are always seen quickly and they do a great job of checking out my kids completely and follow up care. I highly recommend Dr. Mooney. She's so warm and compassionate. She also is a great doctor. One of my kids was having signs of appendicitis but the ER said she was fine. I took her to Dr Mooney who agreed with me that something wasn't right. She sent us to Randalls childrens hospital and within 8 hours of her original appointment with dr Mooney my daughter was having her appendix removed. Luckily it had not errupted as dr Mooney caught it in time. 24 hours later we were home and my child feels fine. Not even a scar! This is the kind of care every mother needs for her child." "My family is very happy with metropolitan pediatrics. Friendly, professional, and helpful staff and amazing doctors. Both my boys see Dr. Mooney and she answers questions very thoroughly and never rushes through our appointments. The after hours advice line has been very helpful and the doctors and staff are great about answering emails on the myhealth portal. Definitely recommend!" "Dr Mooney is all three of my kids is pediatrician she's absolutely amazing we switched from another pediatric clinic that was just not a good place I am completely thrilled to have Dr Mooney as there pediatrician she is always kind respectful and smiling my kids love her I love her and what makes it even better is that they actually know my kids not just a chart can't say enough good things about this place"